System C are your ground work drills. These should not be considered the basics because they are used in every other drill and thing that is involved in this system. This portion of the system is focused mostly on rifle and footwork which if you do not learn well now, you will run into a lot of issues down the line. The way the system is put together is so everything stacks on top of the next. Each is a piece to a larger puzzle, any missing portion and the puzzle is incomplete. You will hope to drill this enough to get to a point when you can use these as warm up drills to get the day started. It is definitely advised to master these before moving on, you should know when you will feel comfortable enough behind the gun. High Ready is preferred because of it's defensive posture and ability to give you complete control over your weapon. It allows for easier target acquisition and safer movement within a larger group of people. The posture is that of a fighting stance, something very familiar and should not feel awkward on your body. This is to make it easier for you to move and carry a weapon fluidly. It will you to have better retention of your rifle when confronted and give you a better ability to bring your front sight down on closer targets. Punching out your weapon is an addition to your high ready posture. It allows you to acquire a target just as if you were punching something with your fist. You will have better accuracy then you would get from bring your rifle up from the low ready. 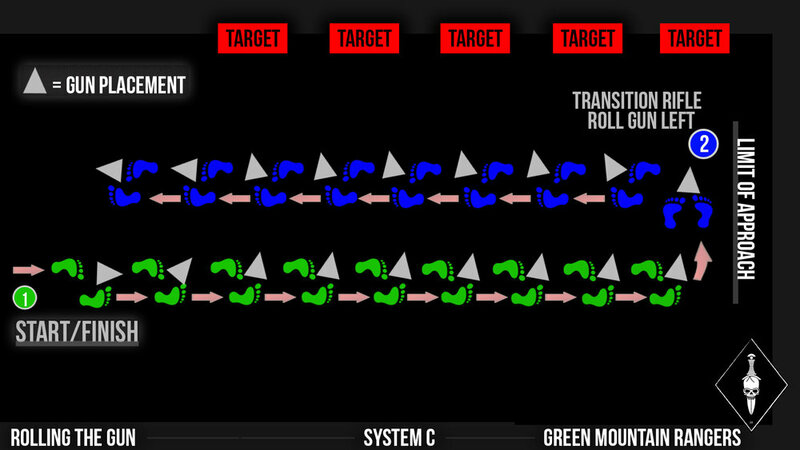 This gives the possibility of dragging your impacts and not being on target with your first shot. When in tight spaces with a group of teammates, the punch out technique may be the only way to acquire your target without your weapon getting stuck on other teammates body of gear. Feet adjacent or weak side foot slightly staggered in front of shooting side foot, stock planted under armpit, elbows tucked in, FSP at nose level, constantly scanning. When threat is acknowledged drive your FSP forward by extending your non firing arm directly toward threat. 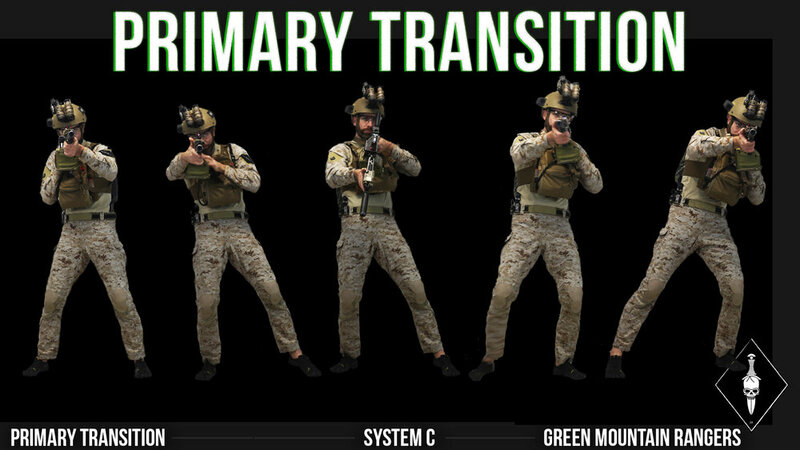 Transitioning your rifle is a technique that you will utilize almost as much as the high ready posture. It is used as a way to not expose your body when firing from various forms and sides of cover. This is used when entering a door way, turing a corner, clearing a bunker or even rounding a tree. This concept can be over utilized causing a lack in security if done wrong. It should only be used when your team is set and you know you are not entering a situation where you will need to fire your weapon. Slide left hand back to your grip and trigger guard area keeping contact with your weapon the whole time. As your left hand reaches the pistol grip and trigger guard securely your right hand should simultaneously slide forward to the front fore grip on your weapon. If you do not have a front fore grip, just use the front part of the Rail system. Rifle still shouldered on your right side with your left hand on the pistol grip you will slightly kick the stock upwards to breach the sling system and clear your body to your left shoulder. Keep your barrel and muzzle straight and try not to deviate them as you make this maneuver. Once your weapons stock has been positioned comfortably into your shoulder, let your body sit into place and allow your eye to adjust to find your weapons optics. If your Primary weapon is empty or inoperable and you are at risk from an immediate adversary, drawing the pistol and point shooting single handed is the preferred method. It allows you to maintain the best control of your movement and rifle, so you do not slow, stumble or stop. This may be a less stable and less accurate method but it will be the most natural in an unnatural situation. This method is less encouraged as it drops your Primary in front of your waist, upper legs and knees. 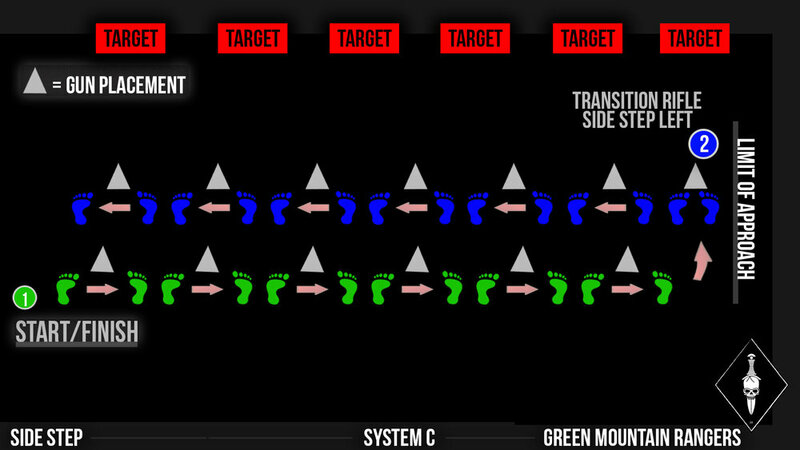 It is directly impeding your movement, which effects your footwork and pace. The collective firepower of a well timed entry group will always be more important to a sub second pistol shot. The intent is for you to solve your problem, if you are dry or gun goes black by all means protect yourself but do not become overwhelmed with your issue and stall the Team's action. But if you somehow find yourself in a static positioning and need to take a well intentioned pistol shot, the low ready rifle placement can be used. Two handed fire will always be more consistent but it may convince you to be stationary. Our techniques are very team based and dependent on timing. Your teammates rifle will always be a better choice then your pistol, keep the train moving. 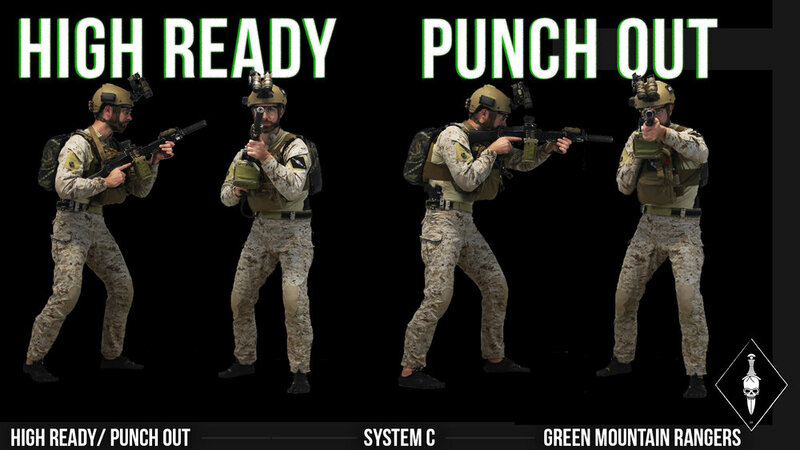 Use your forward hand(hand on rail) to pull the rifle down to the left of your hip, begin to reach for pistol with right hand simultaneously (There should be a brief moment where both hands are near the waistline while switching weapons). From the chest position punch the pistol forward, locking elbows and lats. Use your forward hand (hand on rail) to pull rifle up into high ready, begin to reach for pistol with right hand simultaneously. When there is a lull in action lower the rifle to waistline in controlled manor. Continue to use pistol or call for “check” and get your primary back in action. Rolling the gun is a combination of both foot work and body mechanics. This drill has a huge carry over to cqb but is also often used outdoors on the move. The elbow of the fire control arm is tucked into the rib and the fore grip hand is actively pursuing targets (never tracking or aiming backwards). A good mental cue is to picture yourself pulling the targets toward you. The reason you never want to track or follow targets is because it will slowly become a bad habit leading to a sloppy door pie. Train your eyes to actively look ahead and obtain as much info of the layout as possible or else the targets sneak up causing you to back track. While the upper body is handling target acquisition the hips and feet are facing and moving in the opposite direction while traveling parallel to the target lane. The same footwork used in the forward progression drill but the upper body mechanics are modified to aim left or right. Start standing while in high ready 20ft away from the targets and 20ft before the targets. You will be walking with your feet pointed straight and your Weapon aimed to the side, rolling your body over to compensate for the weapon. The hour glass drill brings together footwork, pacing, teamwork and weapon skills. Being able to scan for targets/teammates while moving at the same pace and simultaneously controlling your weapon are all put to the test with this drill. Learning how to push through the sensory over load of footwork, reloads, malfunctions and communication will transfer over directly to working with a team in a CQB environment. This is a team favorite as it covers multiple skills in a time saving manner once mastered. From bottom right corner transition rifle to opposite shoulder then forward progression to the left corner while shooting on the move target in front of top left corner. Walking forward and backward sounds basic enough to ignore but when reloads, target acquisition, weapon check, secondary weapon, and debris on the ground are thrown you would be surprised how fast the mind short circuits and becomes overwhelmed. Although very basic this is a great warm up drill to get your head in the right space before moving on to more complex work. Body position should be aimed forward and squared away facing the target line. Do not bob up and down, maintain smooth and level rifle. Wide steps or shorter quick steps. Course of fire to give repetitive side step technique. The shooter is to maintain a solid core and low base in order to be fluid when shifting weight from step to drag foot. Keeping a consistent head level will stop you from popping up during your steps which will drastically effect your accuracy. Think about an athletic hip shuffle and keep your pacing metered and smooth. This is what you will use when you have entered a room and need to keep moving and take accurate shots on active threats. You are actively engaging but still need to move to make room for the rest of the team. Set line of movement 20 feet before and 20-50 feet away from targets. Using a consistent step-drag technique keeping your chest and toes toward the target line. Keep your core and arms tight to maintain your upper torso as your turret and your legs and feet as the conveyer belt. Stable and balanced, not the fastest method but the safest when a lot of people with guns are in a room. Engage the presented targets with rapid 3-5 successful hits. Actively pursue the targets in the approaching lead, if you are missing you are moving too much and if the targets get behind you then you are moving too fast. Repeat both directions and shoulder maintaining solid form, pace and hits. There is a large physical element to this drill as well.